‘The Fleet / Hithe’ architectural language makes reference to the historic Hithes or landing places of Greenhithe and Gravesend with the forms of the waterfront buildings referencing the historic wharfs of Northfleet. An expressed horizontality articulated at each floor level and an attic storey with dormer windows should predominate the architectural form around the new ‘Fleet’ spaces. A proposed red brickwork with the dark plinth also cross references the other design narratives for Ebbsfleet Garden City. The selective use of colour along the waterfront gable facades, reference the facades of Greenhithe and the use of colour within Gravesend High Street. 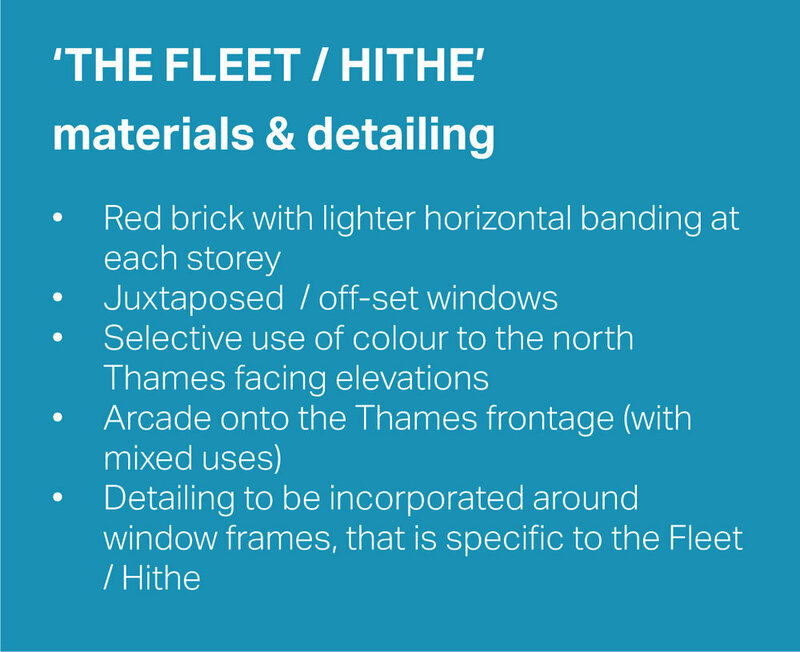 ‘The Fleet / Hithe’ materials & detailing refers to the historic Hythes or landing places of Greenhithe and Gravesend. There is an expressed horizontality at each floor level within the red brickwork and a dark plinth. The selective use of colour along the waterfront facade and window detailing, refers to the facades of Greenhithe and the use of colour within Gravesend High Street. Similarly the distinctive Hanseatic trading buildings of Northern European and Scandinavian waterfronts offer useful precedent for a distinctive architectural vocabulary.